CHEAT MODE unlimited lives, built-in back-door, type CPM on the title screen. There is supposedly a bug that can crash the game if you jump and land a certain way. I remember getting this on a cold winters night and playing until 2am..well late for an 8 yr old.Easily one of my favourite games and also one of the first i completed,happy times indeed. Game soundtrack was amazing- and it was probably one of the first games i completed. Graphics were pretty good, and it was very playable- tough, but not impossible. 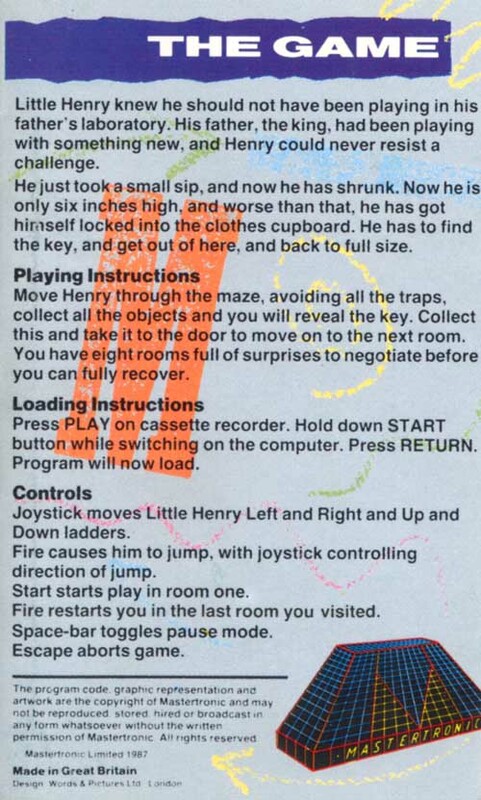 I remember waiting for the end of holidays to play Henry's House again at home. Absolutly brilliant game for its time, and it still holds a lot of good memories, although at times it was incredibly frustrating! Still well up there with my favourite games of all time, even today. The greatest retro game of all time in my opinion. The controls are spot on and the level design is borderline genius! The only slight disappointment is that there isn't an ending screen - you simply loop back to the first level. However, you can't really complain with what's here. I didn't touch this game for about ten years but was surprised by how well it holds up today. I still hate that damn bird though! Essentially the game Jet Set Willy should have been. A colourful and highly enjoyable platformer. Great game; even by 1987 standards it seemed like an "old school" platform game, but it was done so effectively. I was particularly impressed with the second screen. I didn't find out until later on that it was a conversion of an English Software C64 game from a few years earlier (Mastertronic must have had a deal with them; I think they converted ElektraGlide to some other formats.) It explains the homages to various games of that time. Type CPM for cheat mode! "Henry's House was originally called Home Sweet Home. The publisher (English Software) of the C64 (first) version wanted to take advantage of the fact Charles and Di had just had Prince Harry so they renamed it. This is why the title piccy looks a bit odd - it was based on one of the Home Sweet Home stitching thingies and never meant to say Henry's House. I've got some silly letter from Buck Palace as the publisher sent a C64 and game to Diane and Charles for them to play - yeah, right... LOL. The reason the caterpillar appears when you type my initials in the title screen (infinite lives) was so I could brag 'it's the only bug in the game'. 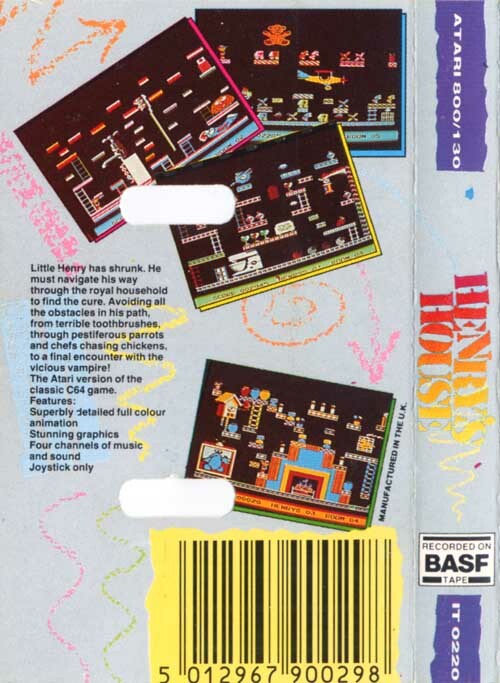 Henry's House on C64 sold for £5.95 or £8.95 (I can't recall which) - I got £1 a unit. 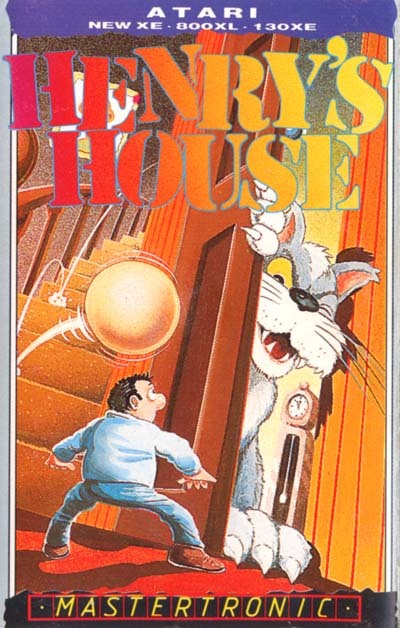 Henry's House on Atari sold for £1.99 under Mastertronic and I got... wait for it... 10p a unit. I had a £1500 advance recouped against royalties which meant nothing more until 15,000 games sold and I thought hmmm... nothing then. I got about £500-£1000 a month for over a year, crazy numbers, and proved a lot to me that there's a price people are willing to pay. I made a lot more from the cheap version despite getting 10 times less per unit. I, er... used to go to John Menzies, Virgin, WH Smith and move my games to number one spots and spread them out a bit."